Behold! 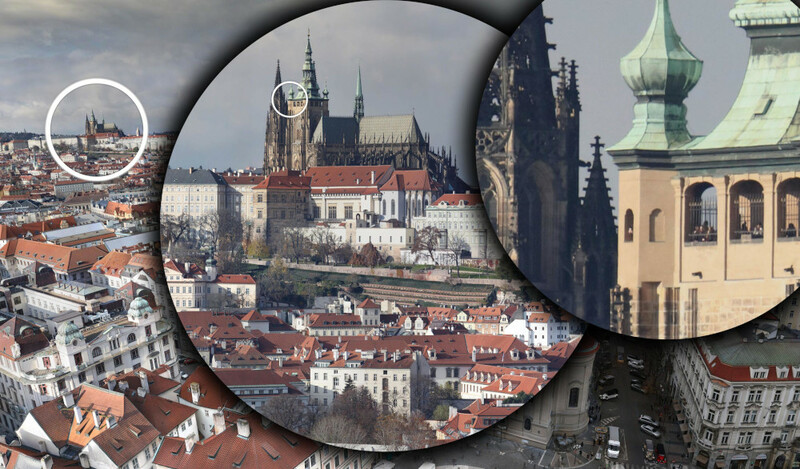 A 400,000 megapixel panorama of Prague! Jeffrey Martin (previously) writes, "I shot this gigapixel image last year in mid November. It's made of 8000 photos, shot with a fullframe SLR and a 600mm lens. It was shot from the top of Prague's 'Orloj', the clock tower on Old Town Square, built in 1410. The tower had a scaffolding all over it at the time, going all the way up past the top of the roof: a perfect platform for a high resolution 360º photo, if only I could get up there! I actually didn't even consider trying, as the answer to such questions is usually 'no'. My colleague, a rather more enterprising Marketing guy, was able to smooth talk them into saying 'yes'. Wow! After signing my life away to the construction company who was in charge of the construction site, I went up to the "top" of the tower - at least, the top floor where tourists normally go when the place is not under construction. Then, stepping out of the window onto the scaffolding, and descending another five floors on rickety ladders and boards sitting on poles, hopefully bolted together with expertise. The whole thing swayed lightly in the wind. A rather terrifying experience, at least the first time. All the way to the top, above the spires of the tower, I attached my eight meter monopod to the scaffolding (with about 20 oversize zip ties, no less) and fired up my trusty camera robot, which would allow me to remotely move and trigger the camera in preprogrammed positions. I did this for three days, from morning until the light faded at around 4pm. When remotely triggering a camera 8000 times, mounted on a robot that is supposed to move in a programmed pattern, things can go wrong. In three days, I shot many sets of images, each set between 4000 and 8000 images, with both a 400mm and a 600mm lens. None of these sets of images actually yielded an acceptable stitched panorama. There were issues of one kind or another with each set of images - some images out of focus, some images overexposed because the sun popped out from behind the clouds for a minute or two. Thus began a very long and laborious process of combining a lot of images, shot at different times, maybe even with a different lens, into a single image. One year later and it's all done. It's not perfect, there are issues that I would still like to fix. But the result is something I'm at least happy to share for now. I hope you enjoy exploring this image. If anyone out there has ideas for what I could shoot next - what tower in what city to shoot from - I'm all ears!